Proven electro-optic and conductive technologies are combined to deliver advanced capabilities in the LV132 discriminating liquid sensor. Internal logic discriminates between water- and hydrocarbon-based liquids. No moving parts and solid-state switching encased in a rugged housing ensure dependable, long service. A slim, compact form allows easy installation into interstitial areas of double-wall pipes and tanks using an integral pull ring to “snake” into place. Remove the pull ring and the LV132 installs into any tank or reservoir via 1/4 FNPT fittings for high, low, or intermediate level detection. The LV132 sensor is easy to remove, clean, and reinstall after an alarm condition is triggered, or for maintenance. 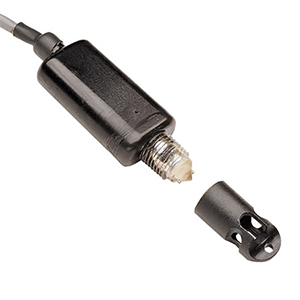 The LV132 electro-optical/ conductivity sensor contains an infrared LED and a light receiver. Continuous light from the LED is directed into a prism which forms the tip of the sensor. Two probes extend from the prism to measure conductivity. With no liquid present, light from the LED is reflected within the prism to the receiver. When rising liquid immerses the prism, the light is refracted out into the liquid, leaving little or no light to reach the receiver. Simultaneously, the conductivity probes determine if the liquid is conductive (water-based) or non-conductive (hydrocarbon-based). Sensing the change in light intensity and measuring the liquid’s conductivity level, the receiver actuates electronic switching within the unit. A logic circuit built into the sensor housing evaluates the two inputs and gives one of three output signals: Dry, Water Present, or Hydrocarbon Present. Output: TTL/CMOS Compatible. May sink up to 40 mA, up to 30VDC. Not recommended for use in any liquid that crystallizes or leaves a solid residue. 참고: Comes with 25 ft four (4) conductor PVC jacketed cable and complete operator's manual.